Who is she? She is nothing in herself, like all other creatures, but thanks to God’s work she is the most perfect among creatures. The most perfect semblance of the divine being in a purely human creature. She derives, therefore, from the Father through the Son and the Spirit as the Creator who from nothing, in the image of Himself, in the image of the Most Holy Trinity, calls finite beings into existence, out of love for His own finite likeness which they reproduce. Beings endowed with free will and reason know and acknowledge their provenance and are aware of having received from God all they are, all they can do, and all they possess at every instant. They reciprocate with love, both for what they have received, and for the fact that He, as infinite perfection, is worthy of infinite love. Consequently, as limited beings, unable to render unto him infinite love, at least they overcome the constraints and efforts of such love. The Immaculata never had any stain of sin, which means that her love was always full, without flaws. 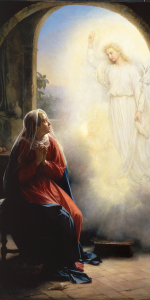 She loved God with all her being, and love united her with God in this perfect fashion from the first instant of her life, such that on the day of the Annunciation, the Angel could address her saying: Full of grace, the Lord is with thee (Lk 1:28). She is therefore a creature of God, the property of God, the semblance of the image of God, the daughter of God, in the most perfect way possible for a human being. She is God’s instrument in full awareness; she lets herself be guided by God. She conforms to His will. She desires only what He wants; operates in accordance with His will and in the most perfect way possible, without the slightest blemish, without any deviation of her will from His-[She is God’s instrument] in the perfect use of her faculties and privileges she was granted in order to carry out always and in all things, solely and exclusively God’s will out of love toward God One and Triune. Such love toward God reaches such heights that it produces divine fruits of love. Her union of love with God reaches such a point that she becomes the Mother of God. The Father entrusts His own Son to her, the Son descends into her womb, while the Holy Spirit, from the body of her, shapes the most holy Body of Jesus.